'In a globalized environment where the internet can bring us closer to millions of customers abroad, there is no meaning in depending on our local economy. With digital exports of products or services we can bring income to our own country contributing to its further development”. Can you say discount in Greek? Athina is the happy owner of Glossopolis the ‘Language City’, an e-learning platform for the Greek language. Launched one year ago, the company offers Greek language lessons to tourists travelling to Greece. The Idea is to enable them interact with the local community and thus, discover the country's language and culture. In compensation for the effort made, tourists get 15-30% discount in more than 100 shops and restaurants in Greece. A surprise is also waiting for them! This innovative concept comes from Athina’, a young Greek lady who participated in the ‘Erasmus for Young Entrepreneurs’ programme in 2013. During her stay abroad with an experience entrepreneur, she dealt with several activities ranging from the daily management to the promotion of a small business. Most importantly, she gained a clear understanding of the European entrepreneurship scene. Back to Greece, with the connections made in Brussels, and the market research conducted, she decided to take the step of becoming an entrepreneur and this is how Glossopolis saw the light 2014. The business, which is located in Athens, is running successfully for the past year and has already shown growth in terms of staff and revenue- the company employs now five full people and attracted travelers to Greece from 118 different counties across the world. The new business attracted huge media coverage, which enhance the credibility of the business and therefore contributed to partnering with Tour Operators. The "Speak Greek and get discounts” concept also excelled in various competitions in Greece. 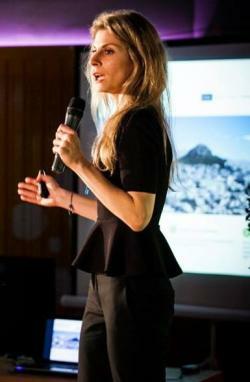 Athina is also a dynamic member of the Greek startup scene as she is a member of the Orange Grove incubator. She also won a scholarship for the MBA International Program of Athens University of Economics and Business. The economic crisis did not fright Athina to startup. On the contrary, she believes that digital entrepreneurship is most likely the response to these turbulent times.